Volunteers installing native plants along the banks of the Mianus in Stamford, CT.
"When we hired One Nature to create a master plan for our ecological restoration of the Mianus River, we did so because they "get it" in terms of the culture, context, and full breadth of what it takes to help broken ecosystems heal themselves. During the process of our work together, we were thrilled to see that they also "get it right" in developing a plan of action that not only looked at the natural changes we wanted to achieve, but also the social and mindset changes we hoped to foster in the many thousands of people who value this incredible resource for recreation and aesthetics. One Nature is a change agent in every sense of the phrase." A Brooklyn waterfront asphalt lot converted to meadow, three months after installation. "The One Nature team designed and led the installation of two native plant sites along the Brooklyn Waterfront Greenway. After one season, we have a rich ecology of insects and a diversity of of plants that have alternately bloomed throughout the season right into November. We are regularly thanked by passersby." Seaside goldenrod shows off its late season color at the mouth of Ash Creek. "The Ash Creek Conservation Association has hired One Nature for several projects over the past three years, including assisting in the development of our estuary's restoration master plan and the reconstruction of an important local park. Bryan and his team bring not only deep knowledge and expertise of ecological landscapes to our projects, but are very savvy in understanding the organizational and political aspects that must be addressed for complex projects to progress from idea to completion. We couldn't be more satisfied with the work that One Nature has done for us over the years (and continues to do)." This model and paper collage was made to help understand the sculptural impact of a newly installed berm and series of planting beds. 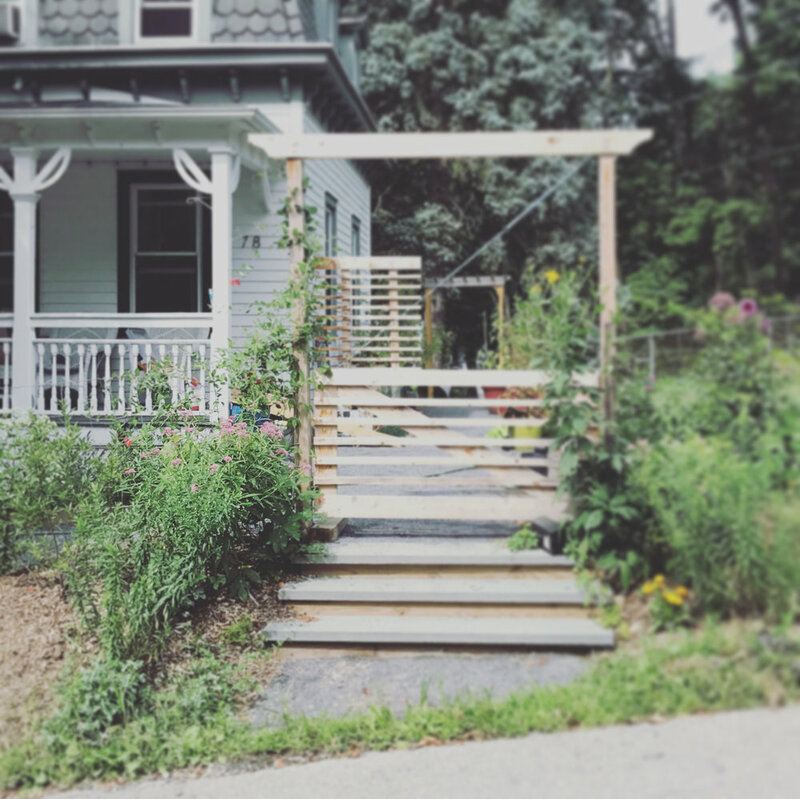 “One Nature took our vague notion of a perfect family yard in the City of Newburgh and turned it into a tangible project. We were able to collaborate on everything from planning to planting. In addition to the project being finished on time and on budget, we ended up with creative solutions to some of the specific concerns we had about our property, and a unique design aesthetic that fits into our neighborhood and is based in sound ecological principals. We are proud of the work we did with One Nature and look forward to future projects! Shown here a re-wilded street edge with new garden entry. We hired One Nature to design and rework various sections of our yard, including flattening and creating patios, managing drainage, re-fencing, and putting in new plantings. One Nature turned a messy, drab and dysfunctional yard into a beautiful and functional garden that we're proud to drive up to. They proposed some great garden ideas and were happy to re-work them based on our feedback; he kept us informed throughout the process to make sure we were happy, and his team were all very professional and did great work. We'll be using One Nature for the next phases of work! "One Nature advised me on the planning and design of a wetland improvement project funded through the Natural Resources Conservation Service involving development of two ponds and restoration of native habitats within the surrounding areas comprising about 15 acres. After evaluating site conditions and laying out an overall conceptual plan for habitat zones, nature trails, and observation points, they prepared a detailed plan for planting groves of trees, site maintenance, and circulation for areas immediately surrounding the ponds as well as supervision of site work. The work went quickly, on schedule and Mr. Quinn was very professional, generous with time, paid attention to detail, and [stayed] within budget."